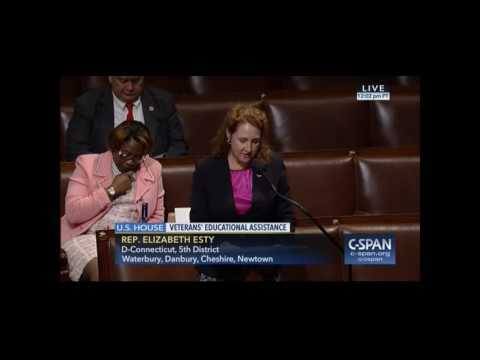 FAIRFIELD COUNTY, Conn. – Bipartisan legislation co-sponsored by U.S. Rep. Elizabeth Esty (D-5th District) to expand and improve veterans’ GI Bill benefits passed the House unanimously Monday night, 405-0. Esty spoke in favor of the bill on the House floor during debate. The legislation, entitled the Harry W. Colmery Veterans Educational Assistance Act, eliminates the 15-year limit afforded veterans to use their education benefits after leaving military service. It also ensures that all Purple Heart recipients, regardless of their length of service, are able to access GI Bill benefits. And it eases eligibility requirements for National Guard members and Reservists, who often don’t qualify for benefits under existing law. Esty is a member of the House Veterans’ Affairs Committee, which voted unanimously to advance the legislation to a floor vote, and the top Democrat on the subcommittee overseeing veterans’ compensation. The bill is endorsed by several major veterans’ service organizations, including Veterans of Foreign Wars, the Military Order of the Purple Hearts, Disabled American Veterans, the American Legion, and American Veterans.